Today, we Bento Bloggers and Friends are joining together for a blog hop to celebrate World Animal Day. Though this is an especially busy week for me at work, I am looking forward to hopping along to see everyone's creations! Top left contains watermelon pieces. Top right contains blanched broccoli florets and butterfly shaped carrots. Below is a flower shaped sandwich topped with colby cheese on provolone leaves detailed with food safe marker. 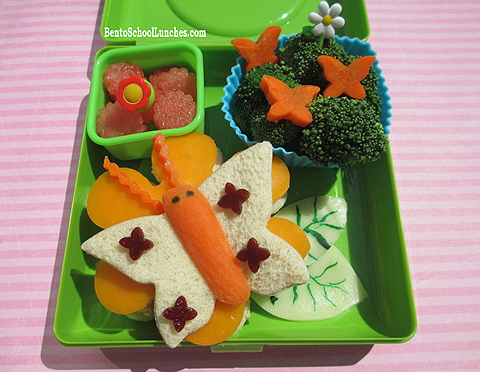 A flattened bread butterfly decorated with organic baby carrot, the antennae are crinkle cut carrot sticks and organic fruit leather on wings. Want to see more World Animal Day themed lunches? Click to check out the next one from Ming at Bento Monsters or click on the image below. Keep celebrating by hopping through the rest of the Blog Hop! Beautiful!! All of your special touches in this lunch are impressive. I *LOVE* your butterfly, Rina! Great job!! Such a pretty butterfly, great job! not only is this cute, but it looks so healthy and yummy too! Rina, I love the leaves!! What a great accessory! ps - the butterfly is gorgeous! This just so artistically pretty Rina! I love the butterfly and the lovely delicate leaves! Your butterfly is just beautiful!! Beautiful butterflies! I'm sure they'll be loved and devoured! your butterfly is amazing ! Beautiful! The whole lunch is so pretty! What a pretty butterfly! This is such an elegant lunch! Butterflies are beautiful! Love it! That butterfly/flower/leaf ensemble rocks my socks off! Wow! Fun, colorful, and nutritious lunch. Love your butterfly it is so pretty! What a gorgeous lunch, so pretty with awesome attention to detail, looks tasty too, love it!